(Bloomberg) -- SoftBank Group Corp. tapped industry veterans from Dan Loeb’s Third Point and JPMorgan Chase & Co. to help oversee a $5 billion technology fund focused on Latin America. Paulo Passoni, who until earlier this year was a managing director at Daniel Loeb’s hedge fund Third Point, will serve as investment partner with SoftBank’s own Shu Nyatta for the SoftBank Innovation Fund. The two will be focused on finding and executing deals, the company said in a statement on Tuesday. André Maciel, who ran JPMorgan’s investment-banking advisory business for Brazil, is joining as a managing partner who will helm the fund’s Brazil office, the company said. Masayoshi Son’s technology conglomerate already holds stakes in many of the world’s most valuable startups, from Uber Technologies Inc. and WeWork Cos. to Didi Chuxing through its $100 billion Vision Fund. SoftBank last month launched the Latin America fund, headed by Chief Operating Officer Marcelo Claure, to invest across the region. It will focus on e-commerce, digital financial services, health care, mobility and insurance. Interest in Latin American startups has surged in recent years. 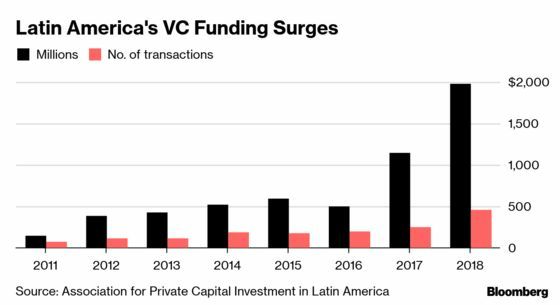 The region drew a record $1.98 billion in venture capital funding last year -- almost twice the amount in 2017, and a 14-fold increase from 2011, according to the Association for Private Capital Investment in Latin America. The bulk of the transactions were in Brazil, the region’s most populous country. Passoni spent more than seven years at the $14 billion Third Point, where he oversaw investments in emerging markets. He left in January with an eye on starting a venture capital firm, before deciding to join SoftBank. Prior to Third Point, the Brazilian native spent five years at the now-shuttered Eton Park Capital Management. He will be based in Miami. Nyatta, who joined SoftBank in 2015, worked previously at JPMorgan and McKinsey & Co. He will split his time between Miami and Silicon Valley. Maciel will be responsible for structuring transactions and overseeing investments in the region’s other early stage funds. He spent 17 years at JPMorgan, working on mergers and acquisitions and equity capital markets with a focus on technology. SoftBank has a history of investing in Latin America. In 2000, it created SoftBank Latin America Ventures to support the group’s companies in the region and invest in startups. In 2017, the parent plowed $100 million into Brazilian ride-hailing app 99. And last year, its Vision Fund invested $100 million in delivery startup Loggi, betting on rapid e-commerce growth.